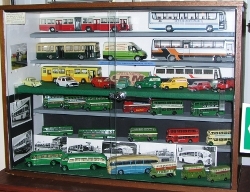 While space is at a premium for our 'full size' vehicles, our regularly changing displays of Lincolnshire Related Models, courtesy of member Harold Abbott, allow us to show a variety of vehicles in miniature to represent some of the vehicles that may not be represented in our vehicle collection. 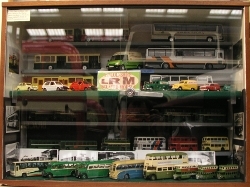 A further selection is on regular display at the Museum of Lincolnshire Life, and others attend events including Truckfest. 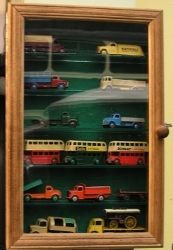 Please note - the displays are regularly changed, and the pictures below may not represent what is currently on display. 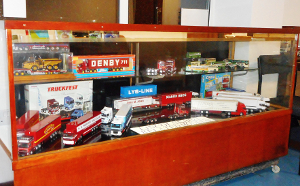 A new display is part of our recently refurbished reception area. 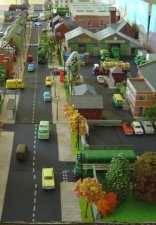 Selection of Lincolnshire Related Models. 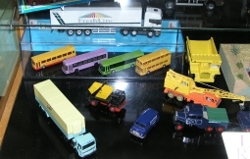 More haulage, and Lincolnshire buses in non-standard liveries. 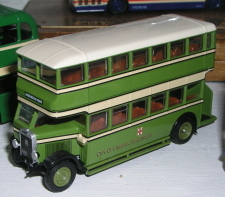 EFE model of Lincoln Corporation Leyland TD1 Titan - one that got away. Lincolnshire Leyland Tiger - this shows the body style and livery originally carried by our Leyland TS7 when it was new. 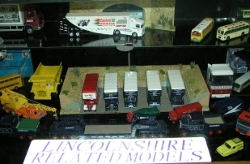 Lincolnshire Related Models on tour - display at Truckfest, Peterborough.